The 2018 APC Series season will kick-off on May 19th, 2018 as a part of the Velocity Weekend at Innisfil, Ontario’s Sunset Speedway. With the 2018 season opener nearing, APC Series officials are proud to announce a new event sponsor in Kleen-Flo Tumbler Industries. Since the series inception in 2015, the season has traditionally began at Sunset Speedway, however this will be the first time the series will open it’s season being a part of Sunset’s massive Velocity Weekend. This weekend will not only be big for the series as it opens 2018, it will be a big weekend for racing at the speedway in general as several other touring and home track series will take part in the action all weekend long with the Saturday night portion highlighted by the APC Series Kleen-Flo 100. Kleen-Flo Tumbler Industries is a proud Canadian company whose history spans 3 countries, 3 principal organizations and over 70 years. The Combustion Utilities Corporation of Montreal, J.A. Tumbler Laboratories of Baltimore, Maryland and Burmah Castrol of the United Kingdom have all contributed to the existence and progressive growth that is Kleen-Flo. Kleen-Flo products are used around the world with significant penetration in North America, the Mediterranean, Africa, India, New Zealand, Asia and the West Indies. Kleen-Flo’s facility in Poland has provided distribution to Eastern European markets. From the humble beginnings of one product, the Kleen-Flo line has grown to over 200 and continues to grow as customer needs change. Today, Kleen-Flo Tumbler Industries, headquartered in the greater Toronto area, is owned and operated by its employees with a keen eye on the future and a proud sense of the past. Sunset Speedway has been home to some thrilling APC Series events since 2015 with the opening race of 2018 marking the 7th event at the tight tricky 1/3 mile for the series. Previous winners at the speedway include hometown hero and inaugural event winner Dwayne Baker, all 3 former champions including Dale Shaw claiming the second 2016 event, Andrew Gresel winning the second 2015 event and starting off his 2016 championship season with a win at Sunset, and of course Brandon Watson claiming 2 victories at the high banks last season. 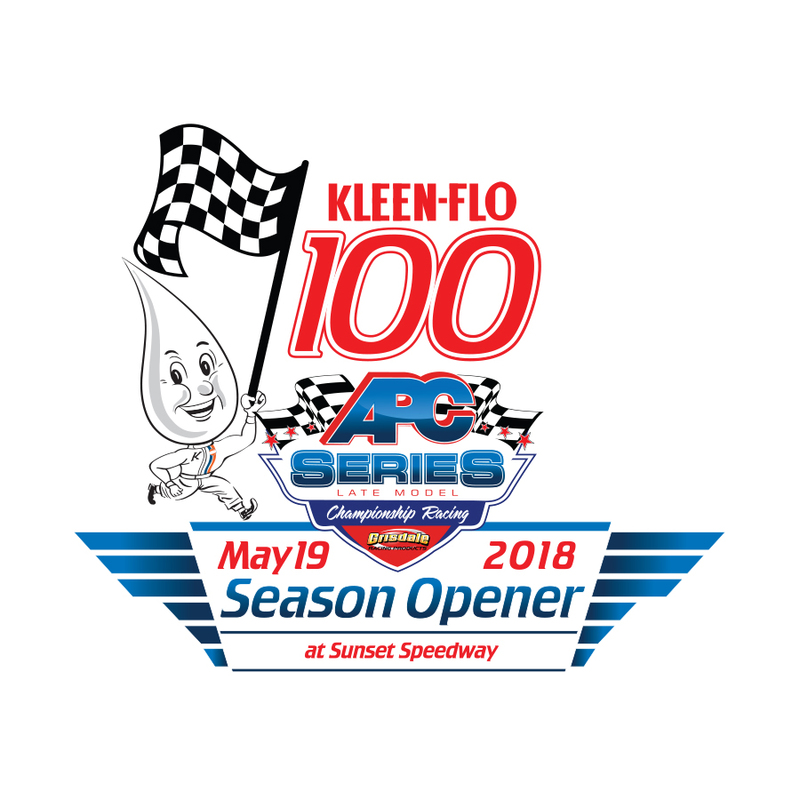 The APC Series is looking ahead to a strong 2018 season, and it all gets started with the Kleen-Flo 100 on the Victoria Day Long Weekend May 19th, 2018 at Sunset Speedway’s Velocity Weekend.